The Shoalhaven river is located just outside of Kangaroo Valley. Turn onto Tallowa Dam Rd and follow it as far as it goes. This will lead you to the Tallowa Dam Picnic area which has a couple of BBQ and normally some wild kangaroo’s bouncing around. This is where you launch. It’s only about 2 hours out of Sydney and is a hidden gem. 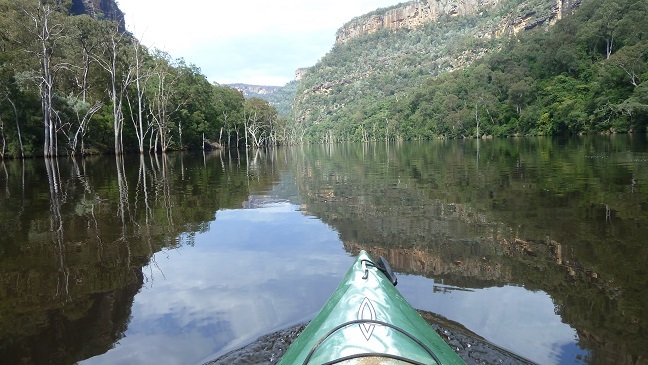 You only need to paddle down Shoalhaven river for about 15-30 minutes and you start gliding through the Shoalhaven gorge. The gorge is a great sight and to date is the best kayak paddle I have been on. What’s great about kayaking down the Shoalhaven river is you don’t need to go far before you get to the beauty of the area. If you’d like to make a weekend of the kayaking trip you can paddle from Tallowa Dam, down Shoalhaven River to the Fossickers Flat camping ground. This is around 13km’s and a great place to camp for the night before heading back to Tallowa Dam. A group of three friends (55-62yo) did this in a heatwave in late Dec 2016. We put-in at Tallowa Dam and each stowed a lightweight 1-2man tent, sleeping mat, summer sleeping bag (not needed), some food an four litres of water in/on each kayak. We paddled to limit of navigability of Shoalhaven River (a few bends farther West than the GPS log shows). Then on way back selected suitable camp site from the three or so on Southern shore. They have drop-toilets, but no other facilities, and no car access. Returned to Tallowa next morning. Had it been less than 43deg, we might have paddled Kangaroo River towards Bundeela, but that is another 20km+ return trip. Magnificent scenery and free overnighting. Bundeela campground is also free camping, if you need car-based camping. If camping via kayak, pack light! Direction to Tallowa Dam for a Kayak. Google Map Link. The Shoalhaven river is located just outside of Kangaroo Valley. Turn onto Tallowa Dam Rd and follow it as far as it goes. This will lead you to the Tallowa Dam Picnic area which has a couple of BBQ and normally some wild kangaroo’s bouncing around. This is where you launch. It’s only about 2 hours out of Sydney and is a hidden gem.